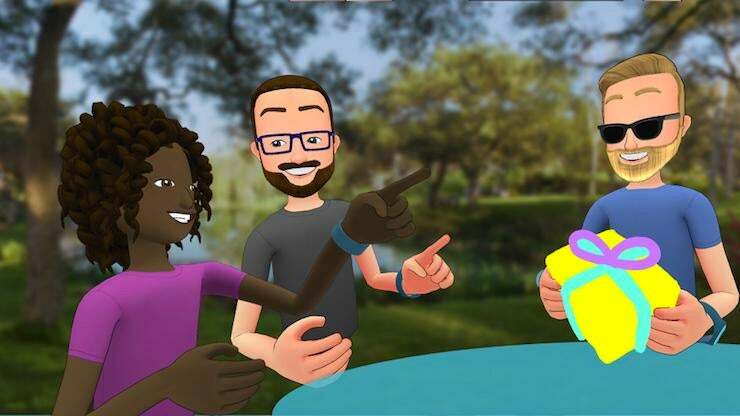 The new Facebook Spaces app, in a closed beta, is the company's latest offering for people who want to share photos and videos with their friends online. In true Silicon Valley tradition, Facebook CEO Mark Zuckerberg kicked off the company's annual developer conference on Tuesday by sharing his vision for the future of the world's largest social network, but not before acknowledging that Facebook's new features sometimes fall short. Zuckerberg took the stage here one day after a Cleveland man, 37-year-old Steve Stephens, posted a video of himself on Facebook announcing his intent to commit murder and then shooting and killing an elderly man. "We have a lot of work, and we will keep doing all we can to prevent tragedies like this from happening," Zuckerberg told the audience. Facebook has often been criticized for how it polices its live videos, which have featured footage of other controversial shootings in the past. On Monday, the company said Stevens's account was not disabled until two hours after it first received notice of inappropriate content, and pledged to quicken its response times. But even as it acknowledges missteps in how it filters the billions of photos and videos on its platform, Facebook appears to have no plans to pause the stream of new ways for people to share them, especially if you own an Oculus Rift virtual reality headset. Starting today, you can download a beta version of the new Facebook Spaces, a one-stop app for sharing photos, videos and other content with friends online. Designed to be used with the Touch controllers, Spaces lets you create an avatar of yourself, complete with custom eye colors, hairstyles and facial features. The avatars can then create and enter virtual rooms with other avatars that your friends create, joining in activities as diverse as playing tic-tac-toe (by drawing your own 3D game board with a virtual marker) to putting yourself in the middle of a 3D video. "We're all about extending the physical world online," Zuckerberg said. "Augmented reality is going to help us mix the physical and digital in all new ways." Zuckerberg has been extolling the social capabilities of VR for more than a year, including offering an early demo of what became Spaces at last year's gathering of developers for the Oculus platform. While Spaces itself is in an early beta, and only available to the tiny subset of tech early adopters who own expensive Rift headsets, it's clear that VR, not text-based status updates, is the way of the future for Facebook. Still, there are a few ways for people who don't have a headset to participate in Spaces. You can make video calls via Facebook Messenger directly from Spaces while you're in VR, and your non-VR friends can even experience many of the same photos and videos from within their Messenger app, including 360-degree videos and 3D drawings. On stage in San Jose, Calif., Facebook's head of VR, Rachel Franklin, made it clear that Spaces is a "very early version" of what she hopes will eventually be a new way for people to connect online. Franklin, who was previously executive producer of The Sims, noted that Spaces can already access Facebook's entire library of 360-degree videos. She said the company plans to expand it to other VR platforms in the future, although it's unclear when it will come to cheaper and less powerful headsets such as the Samsung Gear VR.